You don't need to feel sorry for the Flash. Despite what it looks like, he's doing okay. 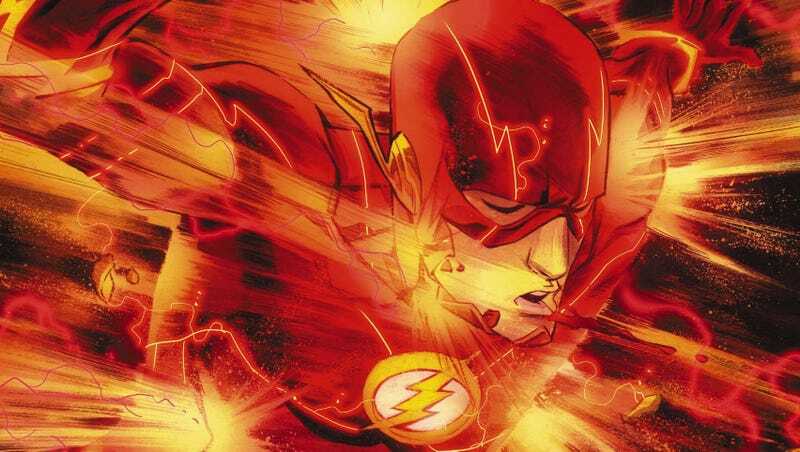 The Flash series has been one of the quieter success stories of DC Comics' New 52 reboot. The Fastest Man Alive hasn't had the kind of high-profile crossovers that Batman, Superman or Green Lantern's books have had. Hell, even Aquaman got a big-deal storyline tied into the Justice League book. But The Flash has managed to be a reliable read without the hype of those kinds of editorial stunts. Creators Francis Manapul and Brian Buccellato have re-configured the powers, mythos and cast surrounding DC's pre-eminent speedster just enough for plot twists to feel surprising, while keeping much of the charm that made previous iterations popular. Barry Allen is weighed down by a ton of dysfunction or angst, making him feel more like a regular guy you can root for. Just look at these preview pages from today's issue #20. He's moving in with a girlfriend, making peace with a messed-up childhood and putting some recent drama behind him. But the newest incarnation of the most vicious Flash villain ever is waiting in the wings. If you don't know about Reverse Flash, he's a villain who killed the Flash's wife in a prior continuity. And Flash snapped his neck in the ensuing fight. There's bad history here. And what we've seen of the character so far hints at a more psychologically twisted take on Flash's opposite number, with bloody victims left in his wake. That girlfriend, that new apartment, that troubled past hidden from view… chances are that the Flash's darker mirror image will be screwing around will all of those in the storyline to come.